Thanks to the joys of Jetstar (don't do it), I spent a Monday in Singapore, and used this opportunity to hang out with the super awesome Ger and Em. We spent the day eating, and they distracted me from my Plane Delay Panic. We distracted ourselves at Muji, before brunching on chee cheong fun (no picture) at the Jade Garden. From there we headed on over to Real Food Cafe, which looks like a seriously delicious vegetarian cafe and I'm sorry we didn't get to eat there. 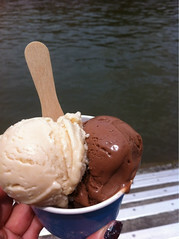 I'm not sorry that we got to try the Brownice icecream, though, which was tasty and melted all over my hands. Since there was three of us, we picked three flavours: peppermint chocolate, peanut butter caramel, and the plain chocolate. It was all good. 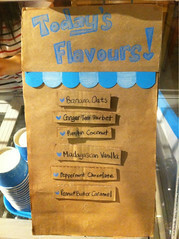 It's ice cream made from brown rice! 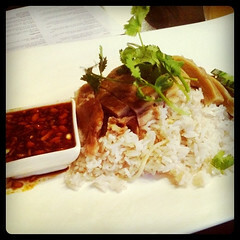 Next up was Hainan chicken rice at Pine Tree Cafe in the Fortune Centre. The Fortune Centre is so amazing, I can't believe I've spent so much time in Singapore and never been there. It's a shopping complex almost entirely filled with vegetarian restaurants and shops! So good. 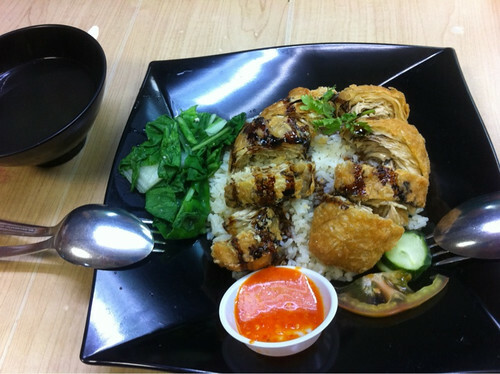 This chicken rice was awesome. I know I spoke highly of the chicken rice I ate at Madame K's only a week later, but this was perfect. 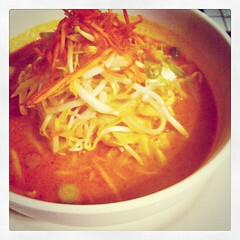 Nice little soup, sauce drizzled over the top, Singaporean and just the way I like it. We followed this up with a visit to the Mustafa Centre (open 24 hours) and then a dosai at the Syed Alwi branch of Ananda Bhavan. 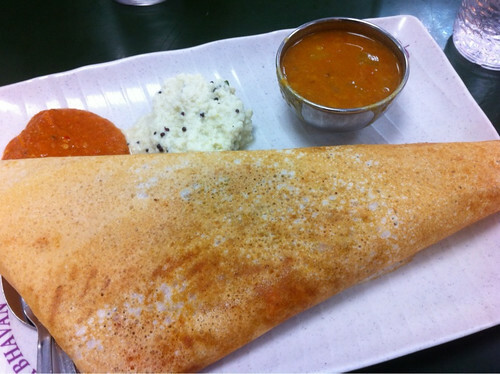 This was my first dosai in about six months and I was very happy to be putting this in my mouth. Ananda Bhavan is a fast service place, a little self-service. There was supposed to be a burger visit, too, but in my paranoia to get on my plan we gave it a miss and went early to the airport. Go to Singapore! It's pretty great. As are Em and Ger. Walking up Brunswick Street heading for Yongs, my eye was caught by a new restaurant fit-out and a nice blue sign announcing 'Madame K Vegetarian.' So of course we detoured! 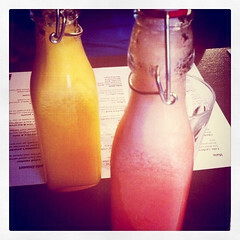 We started with some awesome fresh juices, served in little bottles. My watermelon and apple juice was super delicious; Ju had orange and pineapple which she reported was also delicious (I elected not to sample her juice on the grounds that pineapple is my least favourite fruit). I'm not usually a big entree person, but I couldn't resist trying the chicken and corn soup. This had an excellent corn flavour, and little stringy bits of mock chicken, and lots of spring onions. 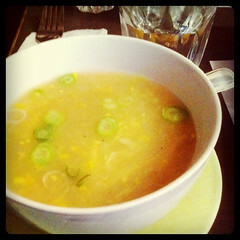 A perfect chicken and corn soup! And it was an excellent size - it could almost be a small meal. Ju and I both struggled to select a main. I finally settled on the chicken rice; the rice was perfectly gingered, and the chicken tasted just as it should, with an accompanying soy+bean Thai sauce with an excellent chilli bite that set it all off excellently. Ju went for the laksa, which was a bit more red curry noodle than assam deliciousness, but was still a pretty good dish on its own. Madame K's also has an excellent and tempting dessert menu, filled with an amazing-looking fruit salad, deep fried bananas, and other exciting things. We skipped this in favour of cocktails at Polly, but I look forward to a future, dessert-included visit! Service here was good, and prompt. Vegan items are clearly labelled on the menu. A main costs about $15. I have been thinking about the menu for a couple of days now, and definitely will visit Madame K's again (though probably not until my triumphant return to Melbourne later this year). Madame K's allegedly has a website, but it doesn't appear to yet be up and running. No other reviews: despite living in Beijing, am I the first?! accessibility: step up to enter, tables are very close together and difficult to maneuver around. get there on the 112 tram (which is not an accessible tram).